If you had mentioned the name Hawksmoor to me five years ago, the only association I would have made was with London architect Nicholas Hawksmoor, protegé of Sir Christopher Wren and architect of at least six beautiful London Churches. Anybody who has walked around Spitalfields market or traveled on the DLR from the City to the Docklands has certainly seen one of them, serene and beautiful. But these days when the name Hawksmoor is mentioned, the association that people most often make is with one of the city’s most popular steak restaurants, one of the first to break the Gaucho’s Argentine-themed stranglehold on the premium steak market. Today you can get your Hawksmoor carnivore fix in one of their four London locations, and it was to the branch in Basinghall Street near the Guildhall that I made my way last year for a dinner matching their food with Italian wines. The subterranean space is surprisingly large and comprises a bar area, dining area and the private dining room where we dined. Before going through to the dining room I enjoyed a cocktail from their extensive list, helpfully grouped together under such headings as eye-openers, pre-prandials, post-prandials, short & serious, and party-starters. Min, from te pre-prandial list, was The Dandy (£11) – Cognac stirred with Maraschino & Benedictine, topped with Champagne – and it was wonderful, not to sweet but packing a punch! 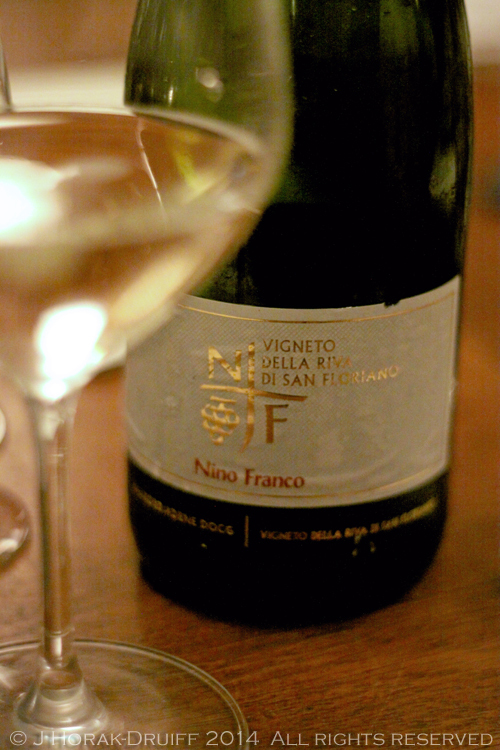 After moving to the private dining room, we were also given an aperitif of Nino Franco Riva de San Floriano 2012 – a single vineyard prosecco from Nino Franco, made with grapes from a tiny vineyard above the hamlet of San Florian. This delicious wine has a ridiculously fine mousse; complex, peachy fruit flavours but beautiful freshness and balancing acidity giving it a clean, almost hopsy finish. Conte Brandolini D’Adda Traminer (Friuli) – a straw yellow colour and a wonderful nose like sweet grape juice, but palate like litchi juice with lively acid and a long, long finish – simply heavenly! Costa di Giulia 2011 – Michele Satta from near Bolgheri in Tuscany. This blend of Vermentino and Sauvignon Blanc had a nose like yeasty, biscuitty champagne. The palate was fresh but also had some surprising sweet berry flavours. Braida Asso di Fiori 2011, a Chardonnay with a lovely gold colour and an extraordinary nose which I likened to good tequila with limey and almost savoury notes. The palate, thankfully, did not follow suit and mellow and rich with lemon marmalade and apricot notes, but with a fresh, clean finish. Deliciously balanced. Primo Franco Grave di Stecca 2009, a premium sparkler from Nino Franco produced from a single limestone vineyard in the Valdobbiadene region. But despite being produced in the correct region and made from 100% Glera grapes, the Valdobbiadene/Prosecco apellation authorities found it too unusual to allow it to call itself a Prosecco. And unusual it is for a prosecco, being markedly dryer and showing more mineral character and complexity than you’d expect in a Prosecco. Whatever it may be called, it is a wonderfully multi-layered wine with delicate fruit flavours, a fine mousse and a clean finish – the antithesis of what most people expect a Prosecco to be. Syrah 2009 – Michele Satta – a deep colour and strident nose of spicy dark fruits and what I call Bacon Kips (bacon-flavoured savoury biscuits I loved as a child in South Africa). The palate was fantastic – a complex mix of dark fruit compote, Christmas spices and chocolate, with a lingering finish. Bricco dell’Uccellone Barbera d’Asti 2008 – another rich, complex wine with dark cherry, liquorice, violets and spice on the nose. It’s a big wine on the palate, nicely structured with grippy tannins and rich flavours of dark cherries, plums and Christmas spices. Not for the faint hearted, but big enough to stand up to any steak! Piastraia 2006 – Michele Satta – this blend of Cabernet Sauvignon, Merlot, Syrah andSangiovese has had 12 months in oak and is bottled unfiltered. It was lighter than the previous two with a bright ruby colour and a nose of fresh red summer berries and a faint grassy note. The palate is also packed with intense fresh berry fruit – a wine that tastes of summer sunshine. For dessert we stuck with an English classic – sticky toffee pudding with vanilla ice-cream (£7.00). This was a fine example, sticky and caramelly, served in cute individual portions. This was paired with Nino Franco’s Primo Franco Valdobbiadene Prosecco Superiore DOCG 2012, one of only two Nino Franco wines (the other is Grave di Stecca) to bear current owner Primo Franco’s name. It is a more classic Prosecco with a delicate nose of flowers and white dessert peaches and similar notes on the palate with an appealing note of sweetness, but still with a well-balanced finish and a fine mousse. Sadly, I had to leave shortly after this, meaning I had to miss the Uccellone Grappa that was served later! It was a great evening for exploring Italian wines – people often seem to think they know what Italy is all about because they’ve had some cheap prosecco in their Bellinis and enjoyed a bottle of Chianti with their pizza. Wrong. The wines we tasted demonstrated that there is far more going on in Italy than most consumers might imagine – and in particular, the Prosecci being produced by Nino Franco would surprise many and would definitely throw a delicious curve ball in any sparking wine tasting. The food, I think, suffered from being served en masse – everything was nice but nothing ended up standing out (with the possible exception of the sticky toffee pudding) – and for the above average prices, you might expect a standout or two. So I’m going to say that the jury is still out on this one and that I think the restaurant deserves another visit, this time as an individual and not as part of a set menu group. DISCLOSURE: I enjoyed this meal as a guest of Nino Franco but received no further remuneration to write this post and all opinions are my own. Forgotten all about this wonderful meal… for me the red wines were total standouts and the whites stunning… the wine wins! Now this will probably shock you that I have never been to Hawksmoor, I’ve heard very good things from some. One day.